The final day of the Watershed was brilliant. The six of us set off at about 9:30am along the beautiful coastal path, and we were joined by brother-in-law Keith (of Section 12), nephew Peter (Sections 11 and 12) and brother Bartow (Section 3) along the way. There were enough episodes in the morning to keep it interesting and fun for all 9 of us - a legitimate "rhubarb" in Trevowhan, some quasi-trespass and near-impassable vegetation, the large Chun Quoit stone, an enormous UFO-like maritime navigational aerial, and conversation about the phenomenal Painted Lady migration this year. We lunched on Carn Brea with a clear view down to Land's End, and the excitement rose. Although we could have avoided part of the A30, we stuck to it as far as the Land's End car park, being joined by my friend Tony (Section 13) in Sennen. I'd previously decided that the finale would not be through the awful theme park, so by arrangement we met the rest of the family on the perimeter. and first-timers: my wife Chris, mother-in-law Dot, sister-in-law Marianne and Karen's partner Reuan. We headed north to the coast - and gave everyone a taste of how rough the Watershed walking can be. A few were in their party best, but they all saw the funny side as we encountered walls, brambles, heather and bog. The last km was on the coastal path, and there was a great reception at the official end - including the only two whose legs weren't up to the final bit, my father Shaun and father-in-law Ray. The photo shows me at the end, supping a pint of Cornish Rattler cider (a gift from Dave Hewitt) from an engraved tankard commissioned by Chris to mark the occasion. The Watershed finished at 342250 on map 203, and the stats for this final Section were 215km and 1,280m of ascent. The party in the Land's End Hotel that evening was excellent, with mini-speeches by 96-year-old Shaun, myself and 6-year-old Rufus. My father had made a great effort to be there at the end, and this blog is dedicated to his memory; he died just a few months later. 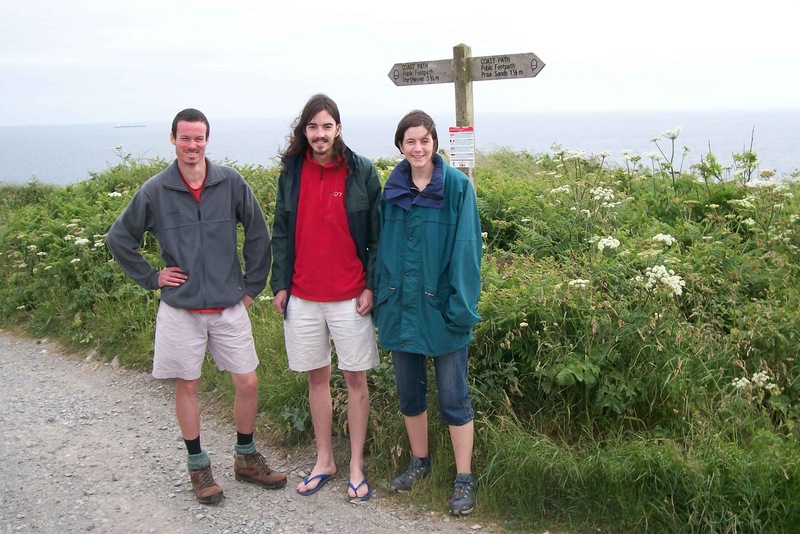 This was a great day, as the six of us walked from the south coast to the north coast of Cornwall. The weather was fine, but our visitors' health wasn't. One was vomiting all morning, and two were subsequently diagnosed with swine flu - it's impressive that they completed the walk. and a final ghastly slog (boggy and overgrown) from Nine Maidens to our camping place at Bosigran Farm. We camped (with prior permission) overlooking Porthmeor Cove at 427372. What a great contrast with yesterday! The weather was fine, and there was plenty of interest in the walking. We followed narrow roads and footpaths through Wheal Busy, Tregullow and Vogue to reach Gwennap Pit (on map 203 - see photo left) at about 11am. I had taken part in the Walk Cornwall mission in 1993, which had culminated in a memorable meeting at this famous Wesleyan gathering place. We then took the B3280 for about 8km - pleasant enough and we made good progress towards our planned rendez-vous with my brother Bartow's four children this evening. After Black Rock we were onto narrower roads and footpaths to Nancegollan, and through the Wheal Vor ancient mining area (more about this in the book). Up and over Tresoweshill and down an overgrown path to the A394 at Ashton. Lisl, Anna, Jonny and Ben arrived by car, and Lisl and Ben joined us for the last part of the walk while Anna and Jonny took the stuff to the campsite (a real one this time). I had spotted from the maps that it was possible to take the Watershed right onto Praa Sands, and then tomorrow up to the north coast without crossing any thin blue lines - so that's what we did. The photos at the top right show Tim, Ben and Lisl on the coastal path, and a very happy me with Praa Sands in the background. We left the Watershed at 580282 to camp at Pentreath. A hilarious evening ensued. Day 123 - glad it wasn't all like this! 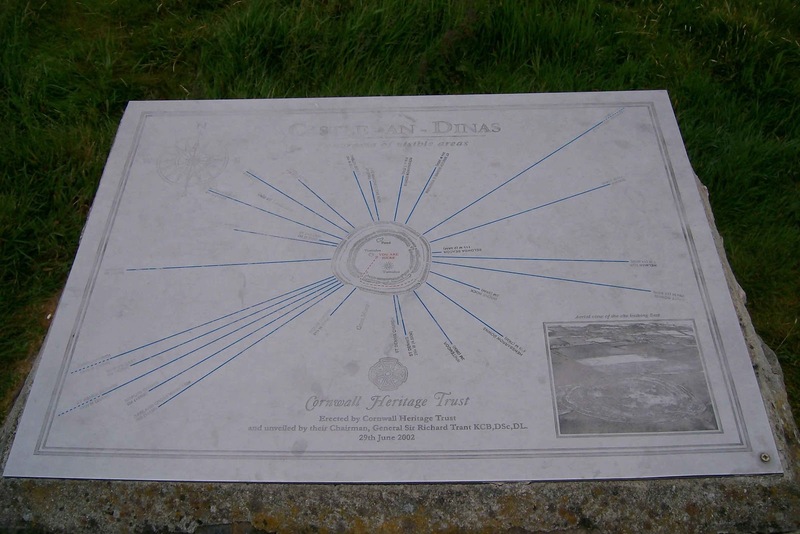 The photo shows the plaque on Castle-an-Dinas where we camped last night. Today was poor. It rained most of the day, and we were on roads most of the day (the A30 after lunch). There was nothing worth photographing or describing! We lunched at the Plume of Feathers in Mitchell, having walked through Indian Queens and St Enoder. We only got off the A30 for about 2km through Zelah (onto map 204), and were very relieved to get to Three Burrows just before 6pm - very wet and badly blistered from the incessant road-walking. 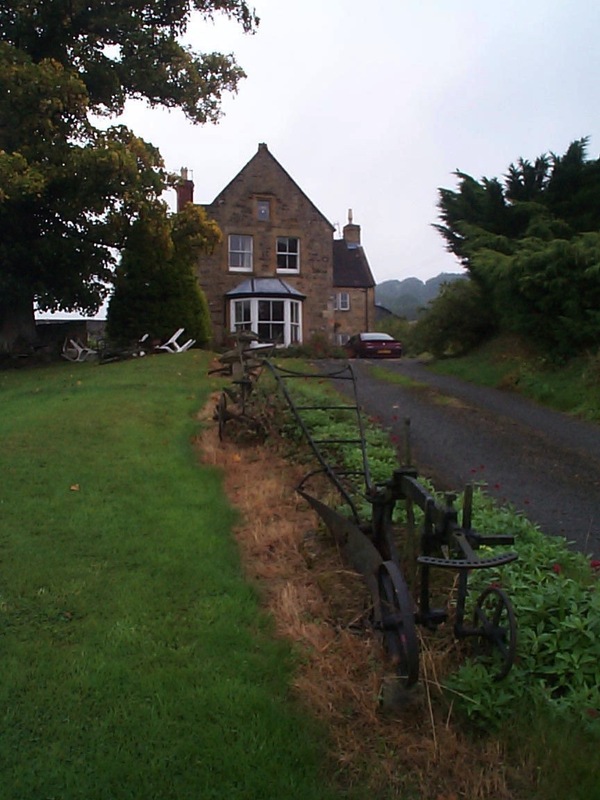 We decided to treat ourselves to a B&B at the Chiverton Arms (744470). Today started and finished on hilltops showing the remains of pre-historic settlements, but along the way there was another example of how things have changed in more recent years. Breakfast was great - sunshine, views all round, dancing gnats and skylarks. We made our way across open moor north then west (onto map 200) to Hawk's Tor with its rocky summit (see photo), then we had a long slog along the busy A30 - impossible to avoid. We left it to drop into Bodmin town, where we visited the impressive church of St Petroc (one of the patron saints of Cornwall), and lunched at the Weavers. We crossed the Bodmin & Wenford railway and then the A30. 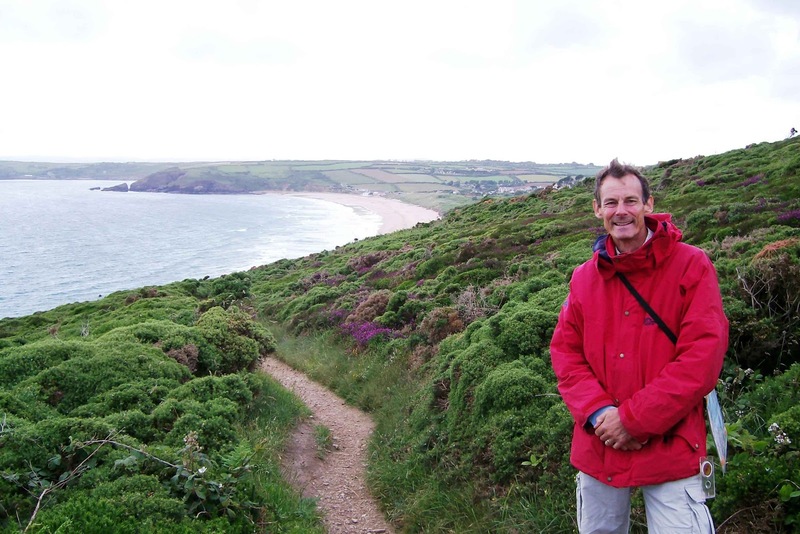 We had a few km of respite from it along narrow country roads, and just as we reached Bokiddick Farm, Tim said he could smell the sea - we weren't very far from St Austell on the south coast at this point. We would have been back on the A30 for a while according to my 2002 map, but it had been dualled, leaving the original road as a deserted byroad. We had good views to the south of the China Clay Mountains. (The new road had gone straight through the site of the historic Bodmin Radio Station). After supper in Victoria, we walked up the B3274, and then made our way to the summit of Castle Downs, and camped within the Iron Age fortifications called Castle-an-Dinas (at 945624). This was an eventful day, despite a lot of it being on roads. We reached the A39 at Wainhouse Corner, and then the watershed veered off to the right, through Tresparrett Posts and Marshgate. This area was the origin of the dreadful flash flood which destroyed much of Boscastle in 2004. 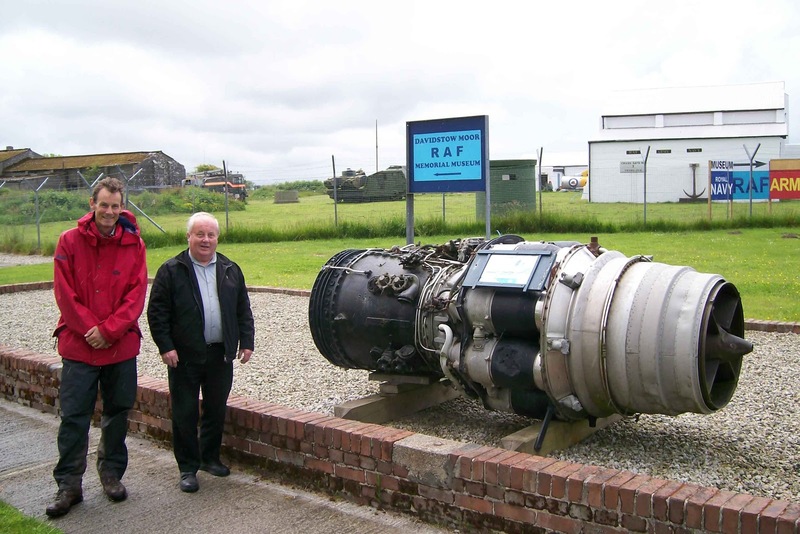 Back onto the A39, and onto map 200, we then turned left at the large Dairy Crest factory ("the home of cheese") and found the tiny RAF museum of Davidstowe Moor (see photo of a Canberra engine) commemorating the nearby wartime airfield. 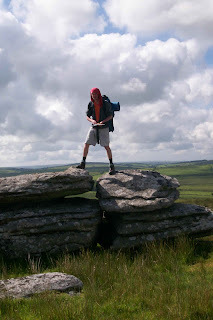 We picnicked by Davidstow Woods, and then (onto map 201) we struck south across open moorland up to the summit of Brown Willy on Bodmin Moor (the highest point in Cornwall at 420m). Chris and I had climbed it a few years earlier from the other side. I shot this short video of the panorama from the top. We dropped down to Bolventor and had supper in the famous Jamaica Inn. In the evening we walked along the very busy A30 (not for the last time, unfortunately), and camped at the top of Brockabarrow Common - at 160748. (The book will tell the drama of the sinking cow). We enjoyed the morning service at St Olaf's in Poughill, and were given a lift up to Kilkhampton by a couple of members of the congregation. 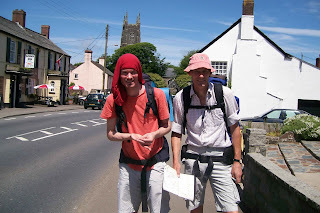 We shopped, and lunched at the New Inn, and we were back on the Watershed (on map 190) at 1:30pm in good weather. The route was due south on the B3254 for a very long way, and we relieved the monotony by dropping down to the young Tamar at its closest point (Merrifield) - see photo. Eventually we turned off on narrow country roads to Week St Mary, where we had supper at a pub and talked with some locals - getting advice about suitable farms for us to camp. They warned us of a naturist colony nearby but we didn't spot anyone. 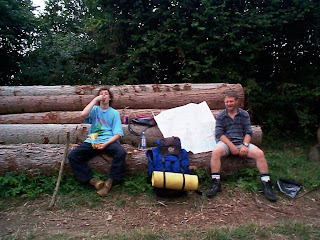 We camped on farmland between Landhillick and Poulza - at 213955. 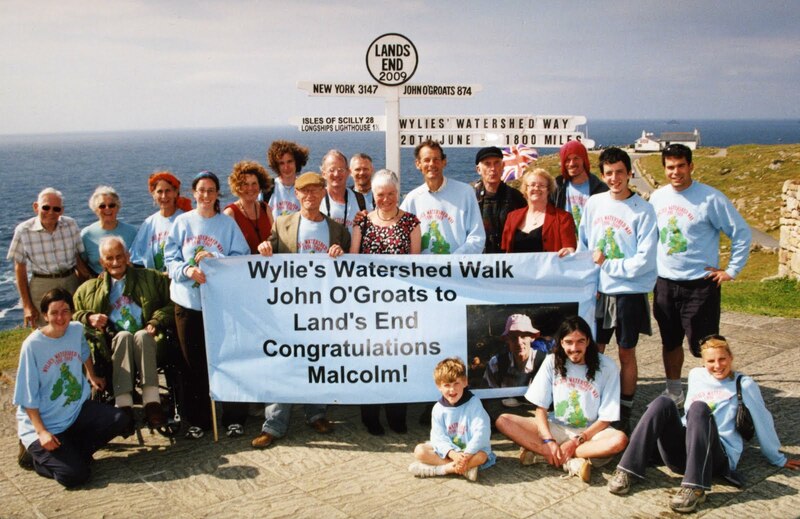 This was the final Section of the JoGLE Watershed, with a long-anticipated denouement at Land's End. Tim was back with me for the whole Section, which was a great joy, and we were to be joined by other relations and friends later on. We travelled down by train to Exeter, and bus to Bude on the Saturday, and spent the night in a B&B. The photo shows us resuming the Watershed in Kilkhampton. The River Tamar marks the boundary between Devon and Cornwall, and it rises within 10km of the north coast. Today's walk was entirely on roads - narrow in the morning and then south on the busy A39 in the afternoon - apart from a short but desperately difficult 200m round the head of the river. On reaching Hardsworthy Farm I asked if I could go across their land to Newlands Farm, because the Watershed went that way. I got permission but the farmer said that there was no way through. I said that I'd encountered lots of difficult terrain over the previous 12 years and that I was sure I'd manage. Little did I know. Suffice it to say that it took me an hour to go 200 metres. I really could have done with a machete. It was swampy underfoot and virtually impenetrable bushes above. I eventually emerged, absolutely filthy and bleeding from several places. 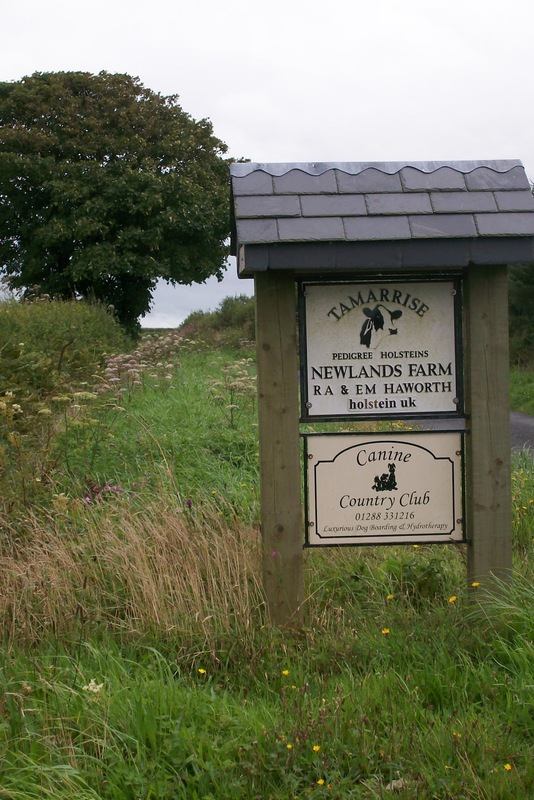 After brushing myself off, I walked up to Newlands Farm, and found a sign "Tamar Rise" (see photo). This was followed by 6km down the A39, with good coastal views - quite a treat to finish off this penultimate Section. I left the Watershed in Kilkhampton at 252112, and hitched down to Bude, where I caught the last bus to Exeter by the skin of my teeth. In the book I'll say how I thought I was being kidnapped by my driver. The stats for this Section were 179km and 1028m of ascent. After the morning service in the church next to Tony's cottage, he dropped me back on the Watershed at 12:30pm. I took the path down to Meldon (about 4km SW of Okehampton, which is now the terminus of the railway system). I walked a short way along one of the railways which was axed by Beeching (and is now a cycleway), and then onto another, which had previously run through to Bude. This route started off quite walkable, but eventually became completely overgrown, so I transferred onto the A3079 and stayed on it all the way to Halwill Junction (onto map 190). I had a good supper at the Junction Inn and learned some of the history of the place. Beeching's decision to close the branch lines which converged at Halwill led to the closure of the station in the 1980s. I was amused at the ironic naming of the housing estate built over it. The disused line to the north has been converted into a cycleway and nature reserve, and made for some good walking. It then became a forest track. 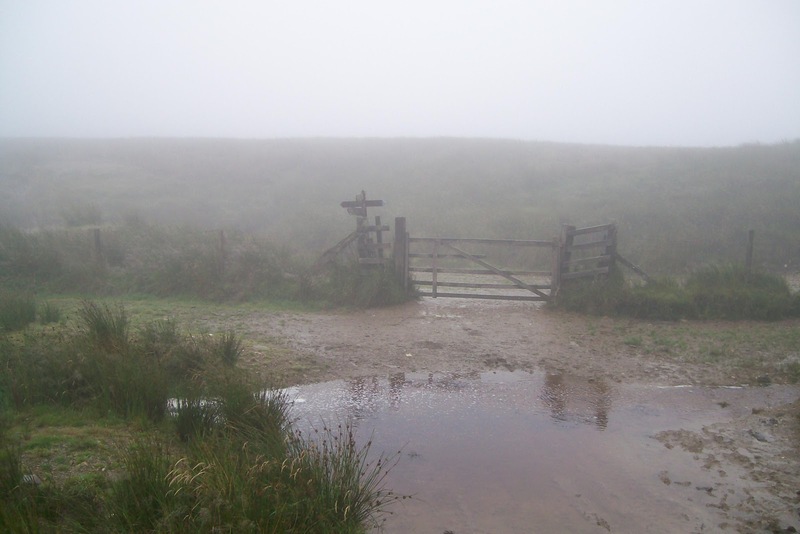 The map showed that I needed to detour from that track, but the Higher Whiteleigh owner refused me entry, and I had to retrace my steps and cross a small trickle. Not happy. 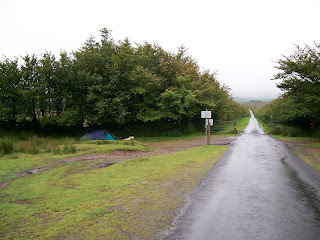 Once out of the forest I was on the A3079 then the A3072 as far as 382042, where I camped (rather late) in another poultry farm with permission. After a splendid evening with Tony and his daughter, he and I were back on the Watershed by 8am - in the hope of missing the worst of the downpour which had been forecast. As it turned out, we started in light drizzle which got progressively heavier - we were drenched. There was also a strong wind on the tops, so it was a tough walk across Dartmoor. I was expecting this to be the last really wild day on the whole Watershed, and it certainly was wild. We passed a well-preserved stone circle on our way up to Hound Tor, on a well-defined path. After that, the going was rougher to Hangingstone Hill. Between there and Great Knesset is a large area of bog, which gives rise to several river systems. We looked for and found the Cranmere Pool Letterbox (marked on the map and shown in the photo). Someone had left half a bottle of straw-coloured liquid in it, which Tony nobly sampled first. It was good stuff! We signed the visitors book, and I left a few postcards there. It was gratifying to learn later that they had been duly posted by a later visitor, according to custom. 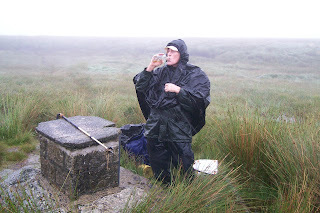 We floundered across the trackless moor in deteriorating weather and were relieved to get down to Sourton by 3:30pm. We left the Watershed at 551907, and took a bus and taxi back to the car. 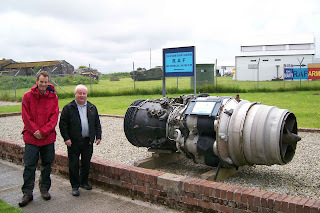 This was a gentle day, as there was plenty of time for me to get to South Zeal to meet up with my golfing friend Tony. He had been intrigued by my Watershed venture, and had offered me his company across Dartmoor, and a couple of nights in his cottage. After walking through Copplestone, I briefly followed the Two Moors Way at Clannaborough Barton. 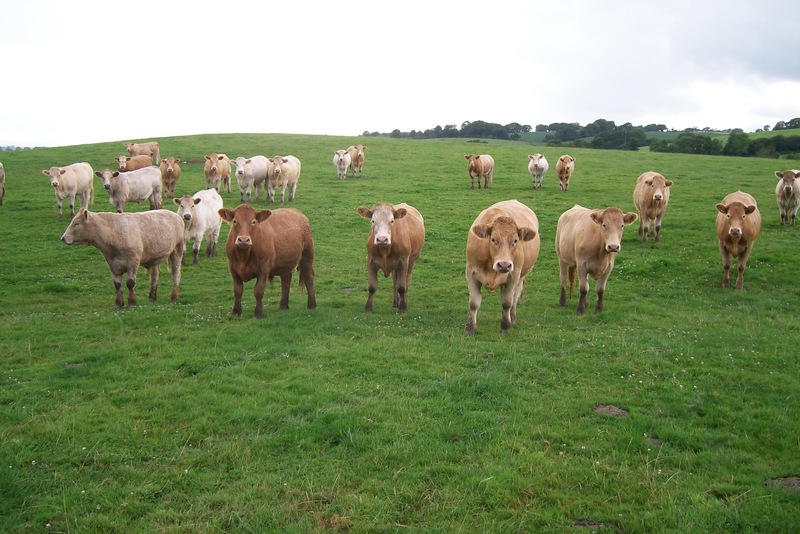 There's a magnificent herd of Red Ruby Devon cattle which have been bred there by the same family for at least 6 generations. I also spent time at the parish church next to the farm, and was amused to see a notice saying that the electoral roll contained nine and nine-fourteenths people! There were plenty of house-martins, and I could hear buzzards calling most of the day. There were no roads or footpaths available between Thorne farm and after Hilldown, and I needed a minor trespass to get through. The only challenge came from a dog. Lunch was at the Tom Cobley Tavern in Spreyton, from where the ill-fated trip to Widdecombe Fair set out in 1802. Straightforward road-walking after lunch brought me to South Zeal by 4pm, and I was met there a bit later by Tony. The Watershed turns south just before the village - at 663931. John and Clare were friendliness personified - not only did they offer me a shower last night, but they invited me in for breakfast as I was leaving this morning. The book will record some of our conversation - well worth a read. Of necessity I was on roads all morning, but with very little traffic. The roads had a distinctive west country feel to them, slightly sunken, with earth and stone banks capped by hedges and trees. When there was a break I had views back to Exmoor and forward to Dartmoor. Onto map 191, I was running late to get to the Black Dog Inn (in Black Dog!) for lunch, but a couple of girls gave me a lift the last couple of miles. I also got a lift back - first time. The afternoon's walk was also along roads apart from a couple of short footpaths across farmland. The cows in the photo were friendly to the point of friskiness, and we played a good game a bit like "what's the time Mr Wolf?". 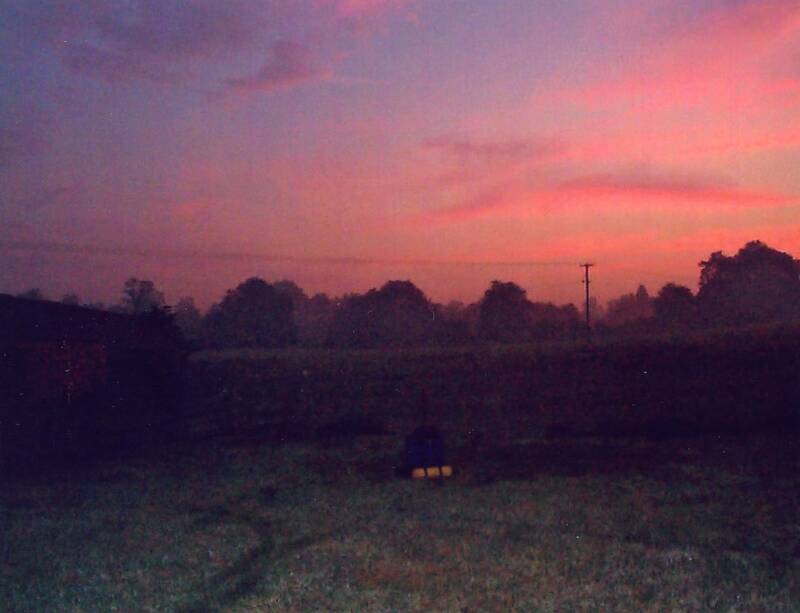 The farmer at Bewsley Farm outside Copplestone allowed me to camp there (770034). 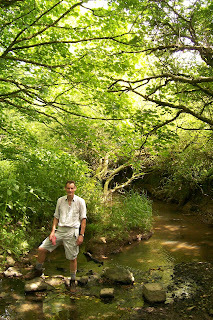 Most of today was on the Somerset/Devon border heading south-east, finishing at the head of the River Yeo. The Watershed was shared initially by the Tarka Trail on a good path, and then a cycle route (NCN3) all the way to Five Cross Ways. 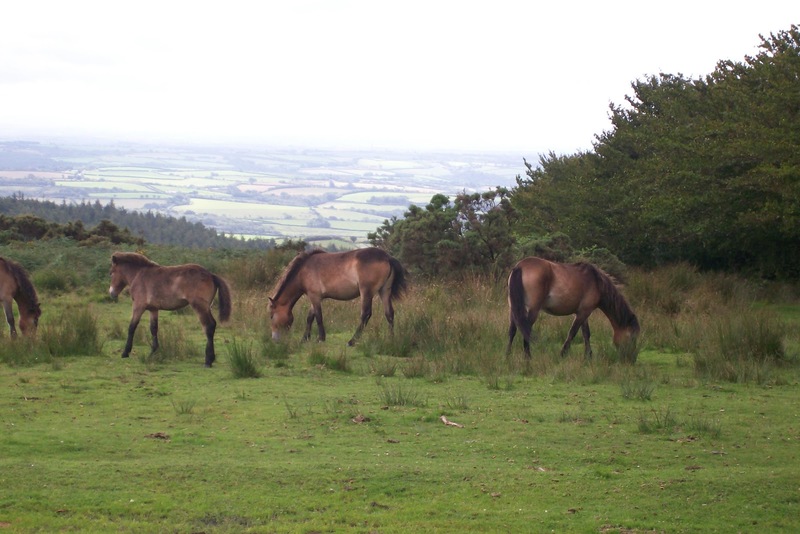 The walking was uneventful apart from encountering some Exmoor ponies (see photo), and being disappointed by the Sportsmans Inn being closed for lunch! Onto map 181, the ridge was interesting in having good views of the Exe to the north (flowing east) and the Yeo to the south (flowing west). I turned sharp right at Five Cross Ways and was offered a place to camp (872262) by John and Clare at a poultry farm in East Anstey. The local pub (Froude Arms) was marked on my map, but had closed 5 years ago, so I hitched up to the Jubilee on the B3227. After a pleasant and long walk up from County Gate, there wasn't much walking time left when I reached the starting point (763417 on map 180). I walked a couple of hours due west from the road. The first 2km were across rough trackless moorland on Exe Plain. There was a sign on the gate as I started which said "Mire restoration. Boggy. Pools." I thought the mire was already adequate, as it was raining hard by now, but I could see that they'd been damming the drainage ditches to recreate original "mire". This was to encourage peat growth. At last I reached the Two Moors Way which I followed briefly to the gate at Exe Head (see the previous post). 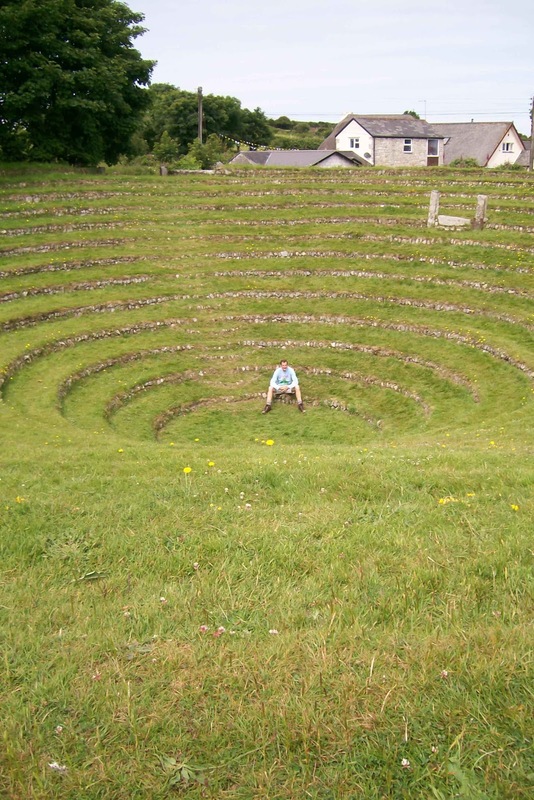 Then I went west on the Tarka Trail to Wood Barrow where I camped (see photo - 716425). Nothing to see in the evening as I was in cloud. This Section is nearly totally in Devon, and takes in Exmoor in the north and Dartmoor in the south, finishing near the north coast again near Bude, having rounded the head of the Tamar - which marks the boundary with Cornwall. The dates hadn't worked out for Peter to join me again this year, but he, Tim and I had enjoyed a great time on the Torridon Munros earlier in the summer. 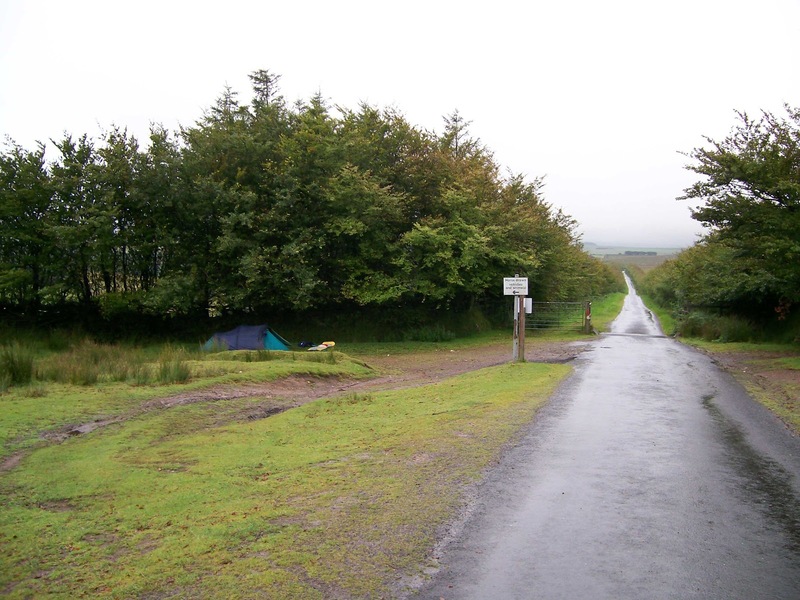 The photo shows the point I reached quite soon after setting off, where the Two Moors Way meets the Macmillan Way West and the Tarka Trail. As you see, the weather was grim. Day 112 - proper Watershedding again! This photo shows where we camped on the last night of this Section. We followed the road shown for 2km, then the Macmillan Way West for another 3km. As yesterday, this was a reasonable path. However, the Watershed leaves it at about 800410 (onto map 180), and we were pathless for the last 4km. I was quite pleased to give Peter the authentic Watershed experience - heavy rain, long tussocky grass, bog-holes, heather and only the occasional deer track to follow along the flat ridge. He coped very well, particularly as he has inadequate waterproofs. We reached the B3223 at noon. We were half a day ahead of schedule, and could have continued on the Watershed around the sources of the Exe, but after debating the options we decided to hitch to civilisation and call it a day. So this Section finished at 763417. To our amazement, in our soaking and bedraggled state, we were picked up by the first car (containing 2 quite elderly women) and they took us down to Lynmouth, where we caught the bus to Minehead and then to Taunton for the train home. The stats for this Section were 98km and 994m of ascent. In the morning we thanked our "landlady" with a bottle of beer in exchange for some water, and set off at about 10am. For the first time in several sections, we were walking in cloud for most of the morning (at about 400m). We took the road and then bridleway over Lype Hill and down to Wheddon Cross, where we met Helen for lunch (in the well-named Rest and be Thankful). She drove our packs to the Dunkerry Beacon car park while we followed on foot, and we then made a leisurely ascent of the Beacon (at 519m the highest point on Exmoor). 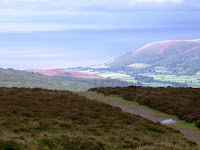 The cloud lifted just in time for photos at the cairn, and over the fabulous Porlock Bay. After Helen left us, we followed the Macmillan Way West on a pretty good path all the way to where we camped at 835422. The last hour was heavy rain, and we were too cold and wet to do much, so we had an early night. We were off again at 9am, and thanked the farmer on our way out. We dropped down to the Grand Western Canal, and walked the towpath for a pleasant few minutes. We then had a struggle with stinging nettles in an area of quarry towards Holcombe Rogus (where we restocked at the little shop). Afterwards we were on narrow roads as far as Clayhanger, where we stopped for a picnic lunch. On the way, at Staple Cross, we watched a horse being shod (see photo). There were more paths and roads in the afternoon as we gradually climbed up to the Brendon Hills, which are only about 8km from the Bristol Channel. The last part was along an excellent green path which had once been a railway. We knocked on a door near the Round House on the B3224, and were made welcome to camp (at 984355). In the evening an IT friend of mine living in Exeter picked us up and drove us to the Rock Inn at Waterrow. 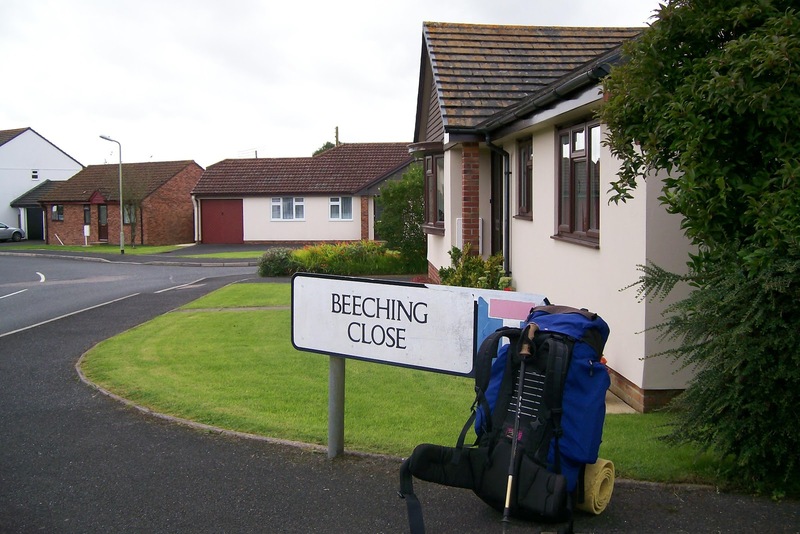 I was pleased to visit this village, as I'd spotted it on the map while planning this Section. It's quite close to the Watershed, but steeply down from it, by the River Tone. Paul very kindly left us with a goody bag for our journey, and £20 sponsorship for my charity, when he dropped us back at the tent. In the morning we went to All Saints church in Trull just outside Taunton with a family friend (whose step-daughter Mary has subsequently married my son Tim). Mike then drove us back up to Holman Clavel where we lunched at the Holman Clavel Inn. Mike joined us for an hour or so along the country road running the length of the Blackdown Hills, with good views to the north over the Tone valley. Onto map 181, we reached the Wellington monument (see photo) - a major landmark for this region. The last part of the ridge is the Gallops on Blackdown Common - beautiful heathland with heather and gorse in full bloom. We then followed roads through Burlescombe, and camped (without permission but with an explanatory note through the farmhouse door) at 075174. We ate at the tent, then walked into the village for a pint at the Ayshford Arms, where were shown the "longest skittle alley in the west". 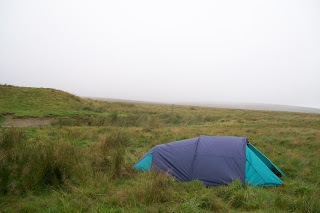 That night I stayed outside the tent for a couple of hours in my sleeping bag in order to see the Perseid meteor shower. I only saw two, perhaps because there was intermittent cloud cover. Peter joined my train to Taunton at Reading. We were planning to meet my cousin Mike on the Watershed that evening, for a lift down to his house in Taunton. By chance we bumped into him while we were in transit in Taunton, so he was able to relieve us of some of our unwanted weight. 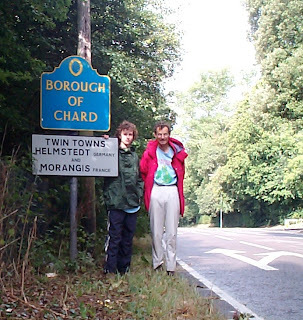 We took the bus to Chard, found the spot where we'd finished last year, and set off on the Watershed on map 193 at 3pm. The first task was to dispose of 5km on the A30 - not much fun. After a short section of bridleway we were on narrow country road all the way to our meeting place. As we passed the village of Street Ash, I pointed out to Peter - "oh look, there are the famous Street Ash Cows" - just a joke. This tickled his sense of humour, and we still refer to it several year later; if he forms a band he's thinking of using it as their name. To relieve the boredom of road-walking, we took a little detour into the wood at Britty Common, where we saw this impressive logging machine. We met Mike at (Holman Clavel - 222160) just after 7pm, and he drove us down to his home in Taunton for the night. This Section was nearly all in Somerset. I walked it with my nephew Peter, as last year, and we were briefly joined by my cousin Mike. 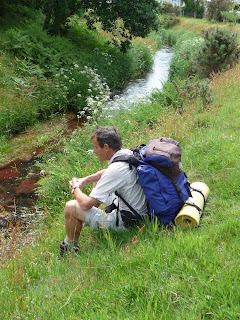 This photo shows Chard, just before we set off, with its little stream at the side of Fore Street. 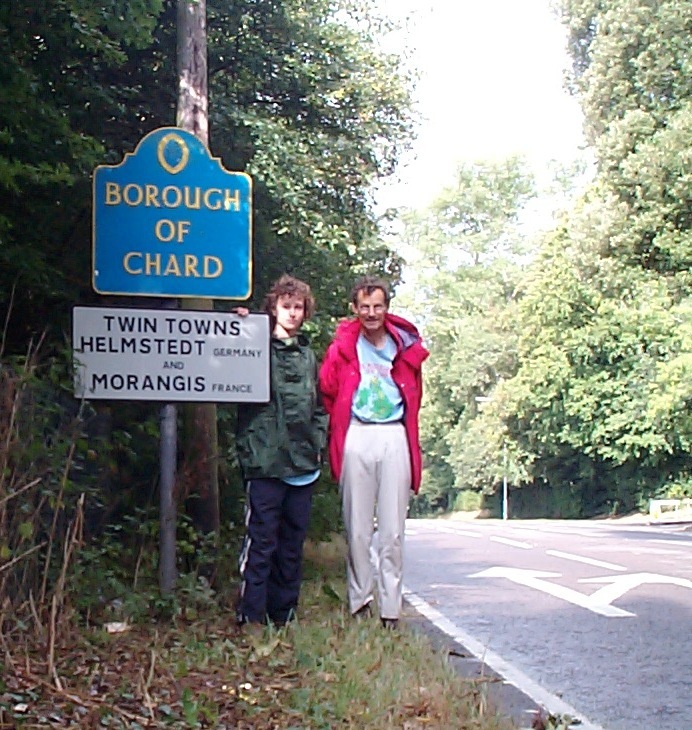 It took us under 2 hours to get into Chard (the highest town in Somerset), from where we caught a bus into Taunton for the train home. There were a couple of mini-dramas this morning. Peter lost his blood-sugar tester (just as well it was the last day, as this was important for him), and I found something like a tick on my eyelid. I was referred by the surgery to the hospital, but on my way there the thing fell off. We discovered that Chard is one of the few towns which has water channels at the side of the streets. (Cambridge is another). Fore Street is reckoned to be exactly on the Watershed, with its little streams parting company to the north and the south. Tricky to spot on the map! [Chard is fascinating for several other reasons, which I'll describe in the book.] We left the Watershed at 322086. The stats for Section 11 were 159km with 1,049m of ascent. We set off at 8:30am up a footpath I'd noticed on the map. It turned out to be completely overgrown with brambles and nettles, and at one point was blocked by a thick hedge. I stubbornly insisted on my rambling rights, but came off worse than the vegetation. 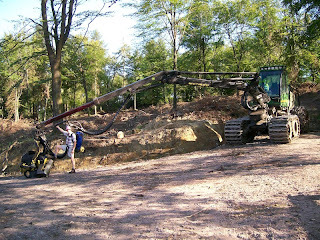 Shortly afterwards we reached the lovely village of Evershot, and watched a thatcher at work (see photo). There was the usual mixture of roads and paths today - mostly pleasant, but we did have to cope with 4km on the A356 before lunching at Winyard's Gap and another 4km on the A30 at the end of the day. The pub lunch at Winyard's Gap was a long, lazy and somewhat liquid affair. We spent some time there playing 20 Questions - I noted in my journal that the most esoteric item on the card was "Gordon Brown's 2005 Budget Speech"! At WG, there was a plaque describing "the Channel Link" - an LDP connecting the English and Bristol Channels. Onto map 193, the afternoon's walk afforded good views north and south as the Watershed runs parallel to the River Axe. When we got to Windwhistle, farmers Derek and Jean kindly agreed for us to camp on their land (at 388094). We dined at the Windwhistle Inn with Jan, and afterwards Keith and Jan left for home. Today, it was just Peter, Keith and me walking. Helen once again found a camping place ahead on the Watershed. We made an early start as I knew this would be Peter's longest day. The morning was a good mixture of largely traffic-free roads and footpaths, with a couple of minor trespasses thrown in - one of which was mildly challenged on exit (Frith House). The other was through a wood above Sherborne (see photo). After lunch with Helen and Thomas near St Antony's Leweston School (map 194), we had a less interesting walk, nearly all on roads. The monotony was broken by the Holm Bushes, a path up Telegraph Hill, and seeing some unexpected llamas peeking over a wall at us. We camped on a hillside at Woolcombe Farm (595055), and then drove into Evershot for a rather splendid meal at the Acorn, which had been recommended by Keith (who lives reasonably close, in Dorchester). After supper Helen and Thomas returned home. Some of us went to the Baptist church in Wincanton for morning worship, and Helen drove the heavy stuff to Milborne Port with a remit to find another camping place. Once again she came up trumps (see photo). After church we were met by Helen, who'd got a taxi back from MP, ready to walk with us for the day. We met Thomas on his bike outside the village at Jack White's Gibbet, where we picnicked. The afternoon's walk was pretty slow, but good fun - a gentle Sunday afternoon stroll without much weight and on a reasonable mixture of country roads and paths. Peter was shocked at one of my "rhubarbs", when we crossed a trickle - my excuse was that the thin blue line wasn't continuous on the map. The family at Spurles Farm were delightful, and gave us access to water, toilets, table-tennis, croquet and boules as well as the space for our 4 tents (at 687199). In the morning I climbed nearby Cley Hill with its fort and tumuli, but because Peter had been flagging yesterday he went more directly into the forest road above Longleat. When I joined him later he told me that he'd had to jump into a hedge to avoid the traffic on the A362! Heaven's Gate was marked on the map as having a good view over Longleat House and Park, so we took the short detour. It certainly was a great view, and embellished with some fascinating sculptures - see photo. 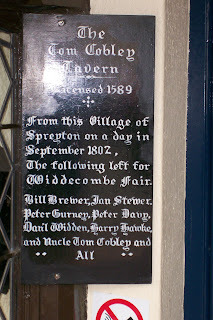 We took roads to Maiden Bradley, and met my brother-in-law Keith and his wife Jan at the Somerset Arms as arranged. After lunch, Keith, Peter and I took the most direct route to a very fine stretch of woodland, and we followed the Macmillan way through it for several km. 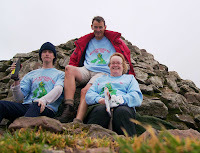 Peter's mother Helen and brother Thomas met us at Stoney Stoke and relieved us of our packs. She was surprised that I asked her to drive on ahead and beg/blag a camping place for us near the Watershed, but she did a great job, and we all camped on a farm near Wincanton at 698303. 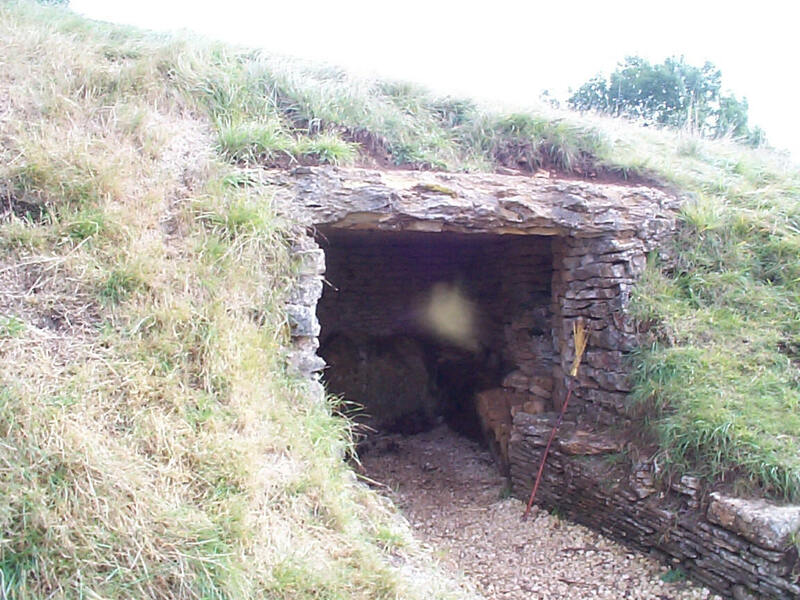 One of Wincanton's claims to fame is that it is twinned with Ankh-Morpok, a fictional city in Terry Pratchett's Discworld novels. We were driven back to Gore Cross in the morning, and walked about 14km along the Imber Range Perimeter Path as far as Westbury Hill. This was an unremitting slog mostly on tarmac, but the weather was fine and the views to the NW over the patchwork plain held some charm. We lunched in a Long Barrow, and then found the Westbury White Horse (see photo). It looked quite odd from ground level. Onto map 183, we continued on the MOD perimeter, and then dropped down into Upton Scudamore. We decided it would be good to get a decent meal in Warminster, so we camped in a field (without permission but with an explanatory note left at the farmhouse) at 855452. Supper at the Farmers' Arms was excellent, and Peter won the torch-lit Scrabble. I met up with Peter at Swindon station, and we took the coach to Devizes. After a pub lunch, during which I learned a good deal about Peter's musical tastes and my ignorance of modern music, we took the canal tow path to our starting point (013617 on map 173). Harvest was in full operation as we followed good paths (but overgrown stiles) south to the village of Urchfont. Thereafter there was a satisfying pull up to Salisbury Plain's perimeter road; the MOD site was clearly marked (see photo). Onto map 184, we met up with my sister Rowan and her friend Phil, and we walked together to Gore Cross (009509). They then drove us into Tilshead and we had an entertaining evening together. During the night the military reminded us of their presence nearby by keeping up a constant barrage of artillery! I was joined by several relations during this Section. My 15-year-old nephew Peter was with me for the whole trip (photographed as we set out from the canal in Devizes), and then my brother-in-law Keith walked 3 days with us. We met up with several others along the way, who gave support in various ways. The Watershed route took us through some pleasant countryside. 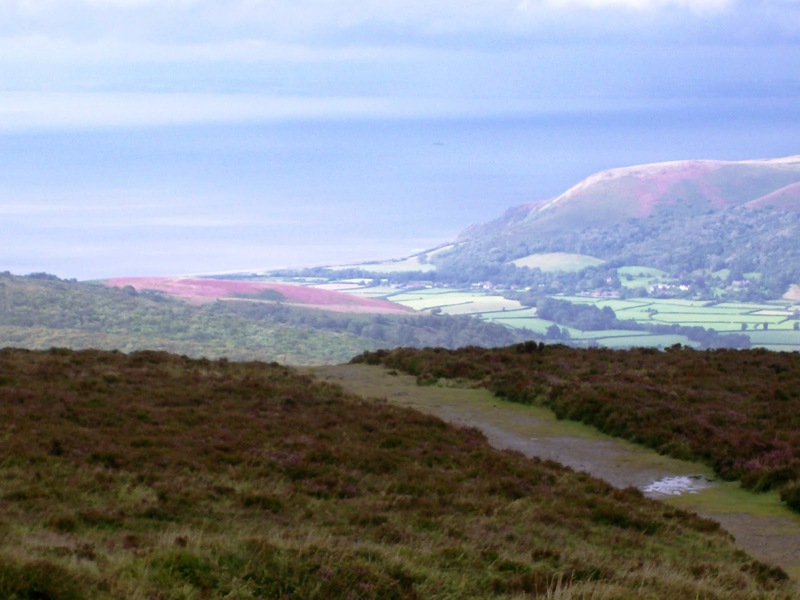 There wasn't much in the way of hills until we reached Exmoor near the end. Since the previous Section had been walked out of sequence, it was a good feeling to be back onto the original schedule. This was a very good final day, with some special moments and only a little road-walking. The pub had an outside loo, which I used at 5am, 7am and 8:30am - a phenomenon I'd noticed before as I approach the last day of an expedition. Perhaps relief in both senses. I set off at about 9am and followed a succession of green roads, muddy rutted trenches, half-metalled tracks and paths for the next 5 hours to get me to Devizes by 2:45pm. The best bit was definitely the Wessex Ridgeway - not spectacular, but pleasant and rolling with even a couple of hills to climb (see photo). There were plenty of tumuli and historic earthworks along the way. 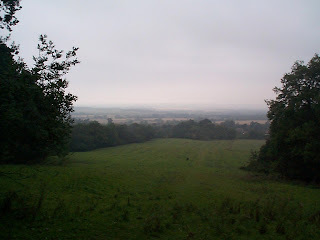 I was very pleased, on reaching the summit of Roundway Hill (just past the pig farm), to look down over Devizes. The final part of the walk was along the Kennet and Avon Canal, and the end of the Section was at 013617. The stats for this Section were 241km and 1289m of ascent. This was Karen's 26th birthday, and she was now half my age. I gave her a card (a view of Blockley, bought there a few days ago) and some perfume which Chris had given to me at Vere's 90th party. Poultry farmer Colin (photo) kindly showed us around his sheds and explained the poultry rearing business. We were off at about 9am (onto map 173), and it quickly became clear that Karen was suffering - knee then ankle then shoulders then hips - so we decided that she'd catch the train back from Swindon today rather than come all the way to Devizes. Apart from aches and pains, the morning's walk was quite pleasant, with enough footpaths to keep it interesting. At Grove Farm (021876) we were adopted by a welsh collie, who simply refused to leave us. This was OK on paths and minor roads (he's just visible 50m ahead of Karen in the photo), but when we reached the B4696 at Lydiard Plain he very nearly caused a car crash. We managed to corral him into someone's garden and found a phone number on his collar (and his name - Ben). His owner picked him up 15 minutes later; he explained that Ben had been cooped up for a long time because of foot-and-mouth and that he must have seen us as a way of getting some decent exercise. Fun, but we were relieved to say goodbye to him. It rained very heavily after I'd left Karen, and the road which rises quite steeply up through Quidhampton Wood had become a stream in itself. I reached Broad Hinton at 6pm, and much to my delight the landlord of the Crown offered me the use of his beer garden for the night (103765). It was lovely to meet up with Karen at the station, and we were Watershedding by noon along the line of a disused railway to the west of Kemble. We soon joined the Monarchs Way across fields to Rodmarton, where we saw some schoolchildren playing hockey. Karen thought the village seemed very well-heeled. We lunched outside the village in a stubble field and then headed for 5km of untarmaced Fosse Way. This was very enjoyable - not too easy, not too difficult, and historic. Nearby Cirencester is the junction of the Fosse Way, Ermin Way and Akeman Street. The rest of the day was uninteresting walking along eastward country roads, but it was very good to be spending time together one-to-one - something which I'd not done enough of when our three children were younger. I'd spotted a pub marked on the map in Upper Minety, and as we headed into the village I explained to Karen how I tried to find camping places. She was nevertheless somewhat shocked when I knocked on the door of the first house. 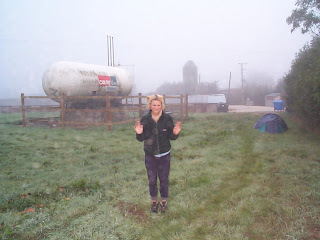 We struck gold, and finished up camping on a poultry farm (see photo) at 004906. This was a very short day, as I'd arranged to meet my daughter Karen at Kemble station the following morning, and I was ahead of schedule. I felt strangely disoriented to begin with at the thought of having time to kill. I was eventually back on the road just after 11am. I thought that the footpath I'd found on the map would be fine, but it turned out to be across ploughed fields, and with derelict stiles. There was heavy rain at this stage to add to the gloom. I cheered up when I found that the route into Kemble took me past the Thames Head pub on the Fosse Way (A433) at lunchtime. 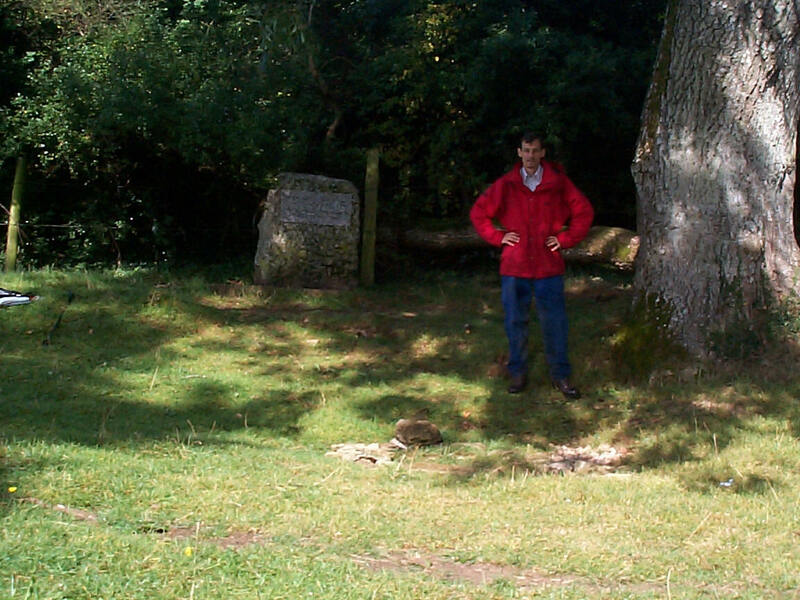 The sun came out, and I decided to take the detour to the stone marking the (or a) source of the Thames (see photo). There was no water to be seen there, and I learned from locals that it only gushes after prolonged rain in winter. 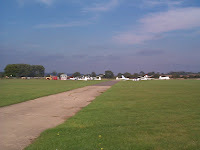 When I got into Kemble at 4:30pm I found a reasonably secluded spot on railway land quite near the station (at 984978). 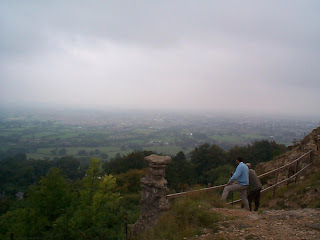 After church in Charlton Kings with Bernard, he accompanied me back up the steep escarpment of Leckhampton Hill, and we parted company at the Devil's Chimney (see photo, overlooking Cheltenham). The Watershed follows the Cotswold Way round the top of the hill as far as the Cotswold Hills golf club, where it continues south on a country road as far as Shab Hill. There were then footpaths to the Gloucester Beeches alongside the A417. This is a lovely spot, but spoiled by the fly-tipping from a lay-by. After a few km of road, I followed the Macmillan Way overlooking the pretty Golden Valley as far as Sapperton. 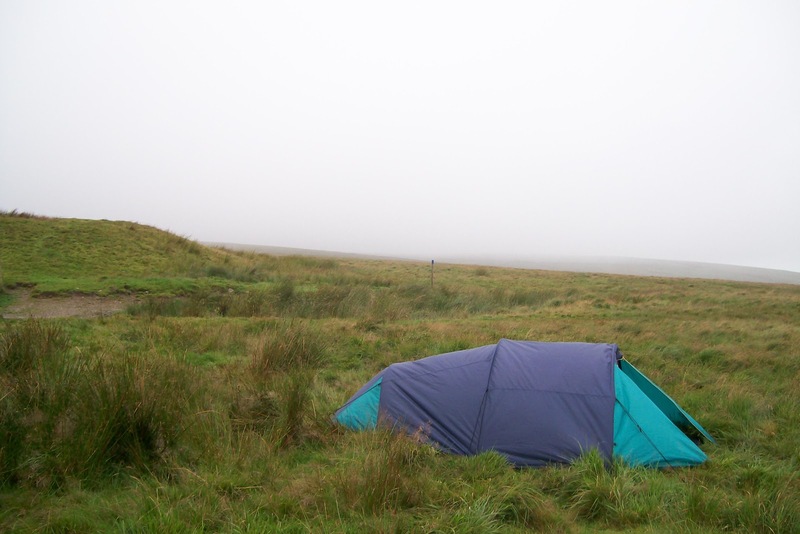 My mood darkened however when none of the locals would offer me a patch of ground to pitch my tent - they all seemed to be terrified of the Earl of Bathurst who owned it all. I went on, with my tail between my legs, to Frampton Mansell, where I reluctantly forked out £35 for B&B at the Crown (924028). This morning's walk was glorious (onto map 163). 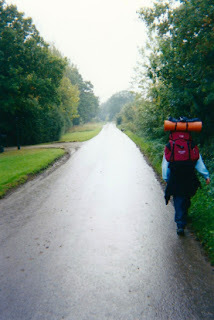 I was on footpaths (and the Cotswold Way) all the time apart from past Charlton Abbots, and Bunny had arranged for me to walk without my rucksack - bliss! There were buzzards all day, green woodpeckers, jays and assorted butterflies. A wonderful late summer day. I was reunited with my sack near the Long Barrow Belas Knap (see photo), where we'd hidden it en route to my starting point. The path continued as far as the Cleeve Hill summit (330m), festooned with radio masts and containing a large artificial pond - presumably for the livestock. I lunched just below the summit, with a grand view over Cheltenham. This was a very special place on the Watershed for me, because I'd spent my youth (8 to 18) here, and one of the regular family walks was up onto Cleeve Common. 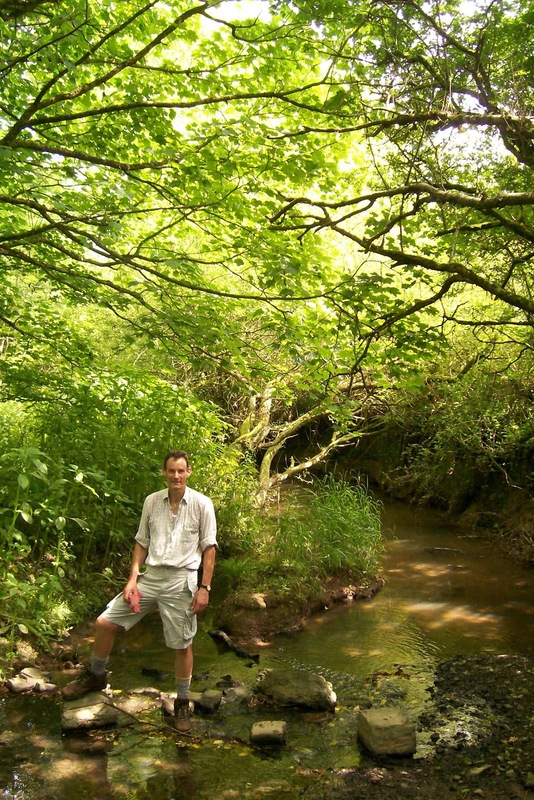 I was full of memories as I walked the ridge, and then down via Whittington and Upper Dowdeswell to Seven Springs, one of several places claiming to be the source of the Thames (and where my grandfather used to go fishing). I left the Watershed at 960184 to drop down into south Cheltenham for a couple of nights with more family friends, Bernard and Jean. Bernard was a long-term walking companion of my father, having done the Coast-to-Coast, Offa's Dyke and several other LDPs together. The following day was off-Watershed, as I took the coach to Oxford for a big family celebration of my aunt Vere's 90th birthday. Today there was drizzle on and off all day, and it rained particularly hard as I went through Moreton-in-Marsh. 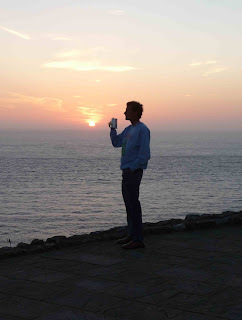 I was offered an unsolicited lift soon after setting off, but not as far as Land's End! Needless to say, I declined. I walked nearly 10km on roads (skirting Hook Norton - famous for its ale - to the north) and had a pasty lunch on a bench in Great Rollright village, where I found an interesting leaflet about the Rollright Stones at the Post Office. 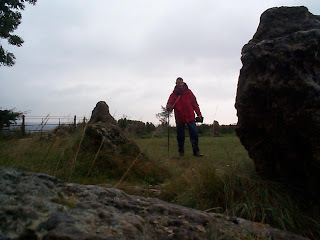 I reached the stone circle (see photo) on a good path, and had a look around. Later on I had to go through the centre of a very wet Moreton-in-Marsh (a good name for a Watershed town), because the intended path round the north was still closed because of foot-and-mouth. The road up towards Blockley got steadily steeper, and I found it rather pleasant to find a decent hill again. Once in the village, the pub locals recommended a friendly farm, where I camped at 169344. The paddock was close to the village church, and the clock struck every hour through the night. Today's walk was more road than path, but the roads were quiet and offered good views of the increasingly rolling countryside. I went through some very select villages including Fenny Compton (just after crossing the Oxford Canal) - best-kept-village, cleanest-fire-engine (as in "Penny Lane"?). On the way I spoke with a few farmers, who were all suffering with the implications of the foot-and-mouth epidemic. Although footpaths had officially re-opened, they weren't all pleased to see me. 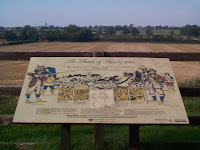 The Watershed coincided with the Centenary Way and the Macmillan Way along Edge Hill, scene of the famous battle in 1642. The site was marked by a notice - rather less impressive that that at Naseby. 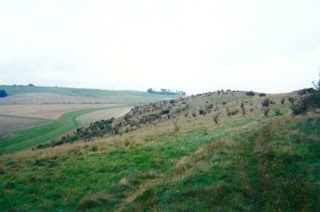 The photo shows the view down from Edge Hill, down which the Royalists had charged. Having passed through Epwell I arrived, pretty shattered and with very sore feet, in Swalcliffe just as the church clock struck 6pm (a nice echo of this morning). I camped with permission in a copse at 379363. 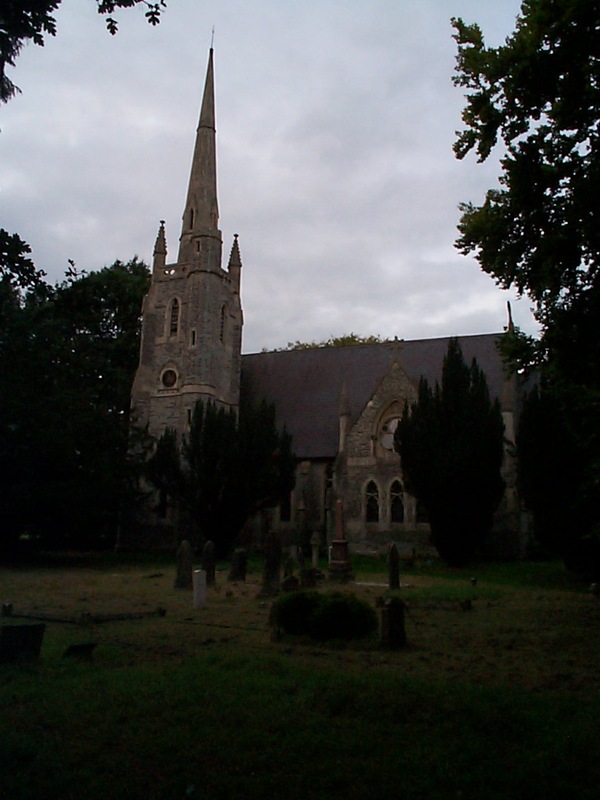 I bade farewell to my parents and sister, having taken the footpath to the NW of Daventry round to the A45. Then I was in on the edge of town, and walked past the Ford parts distribution centre, which used to be one of my customers when I worked with IBM. Once out of Daventry I took paths (including this delightful path through a sunflower field) and roads past Staverton and the official source of the River Nene. Then I was onto map 151, through Hellidon and Priors Marston, and finally into Priors Hardwick. There were lots of young pheasants around here (and in several places during this Section). The fourth door at which I knocked on the way into the village was opened by a Mrs Parkes who was rather taken aback by my request to camp in her paddock (473562), but a phone call to hubby settled the matter in my favour. This section has been blogged as though it took place in September/October 2005, whereas I actually walked it in September 2001. 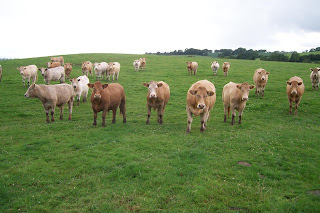 The reason for walking it out of the normal geographic sequence was that foot-and-mouth in 2001 was still a problem in the north Pennines, but had subsided further south. 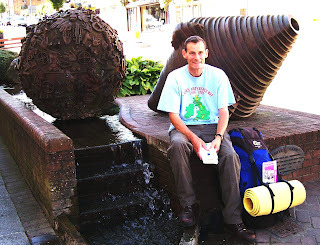 The reason for blogging it in 2005 is so that the blog follows the geographic sequence, which I think will be more helpful to those interested in the JoGLE Watershed route. 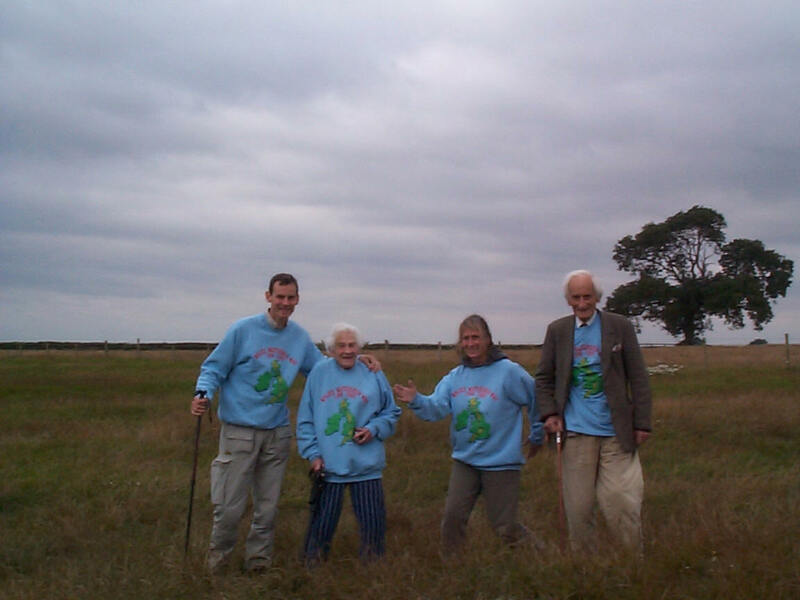 I walked the route solo, but I was joined very briefly at the start by my parents (Shaun and Odette) and sister Rowan (shown wearing their newly minted sweatshirts), and later on by my daughter Karen for a couple of days. I followed roads and footpaths through Crick, under the M1 and railway line, then over the railway tunnel and M45 near Kilsby. Onto map 152, a few more km of roads and footpaths (in heavy rain as indicated by the "shepherd's warning" in the earlier red sky) brought me to the end of this Section at 566652. Since I had started Section 10 in 2001 (out of sequence because of foot-and-mouth), the Section end/beginning had totally changed: in 2001 this point was open farmland, and in 2005 it was an enormous housing estate. The stats for this Section were 146km and a paltry 300m of ascent (possibly a bit under-estimated). I was off early, before the playgroup kids arrived at the hall, and had breakfast by a lake just beyond Gilmorton, having crossed the busy M1. Afterwards I skirted to the north of the Bruntingthorpe Aerodrome Proving Ground (because of security fencing), and got to Husbands Bosworth in time for lunch at the Bell Inn. At this stage the Watershed gets back into a more rolling and interesting landscape. This is the NE end of the Northamptonshire Uplands, an extension of the Cotswolds (of which more later). 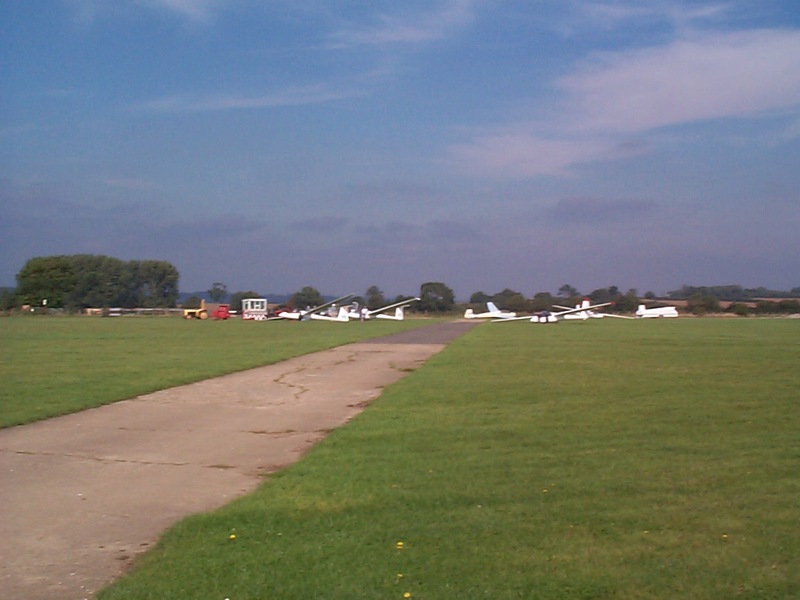 Onto map 141, I crossed a landing strip (see photo) used by a gliding club, with permission and a warning "always to look downwind for approaching aircraft". 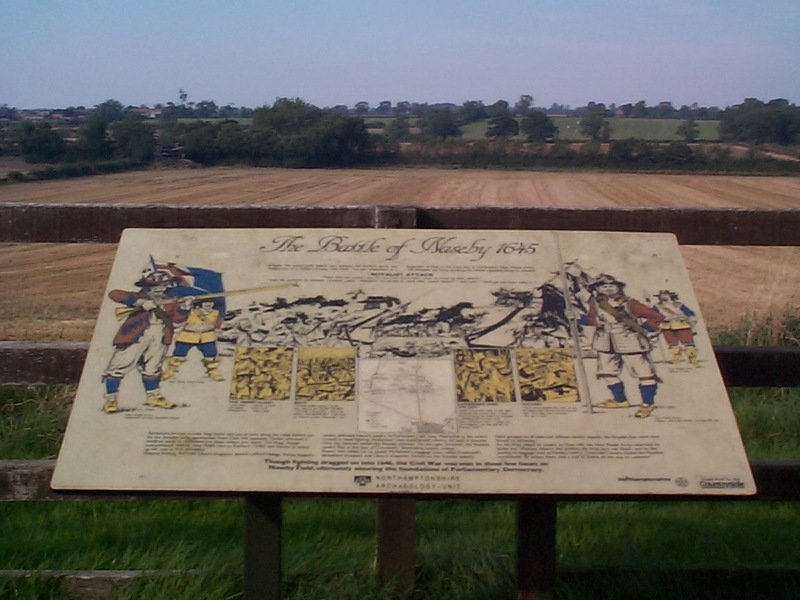 I joined the Jurassic Way briefly on the way into Sibbertoft, and then went due south across the battlefield of Naseby on a country road (the photo shows the plaque which describes the historic site). Then across the A14 into Naseby village, and a photo of the source of the Avon (see the post for the start of this Section). At this point the Watershed swings sharply to the SW, and I followed roads through Cold Ashby (back onto map 140) to West Haddon, where I camped (without permission) a discreet distance to the west (at 625718). In the morning the Watershed continued to coincide with the Coventry Way round the north of the city. It goes right through the middle of Bedworth, where there is an impressive water tower. I met Barry carrying a ladder, who told me that his grandson was playing for Cambridge City FC. The route crossed the Coventry Canal, where I stopped to watch a beautiful narrow-boat making stately progress, and the M69, where I didn't stop to watch the lorries. Lunch was at the Rose and Castle in Ansty by the Oxford Canal (see photo). The afternoon was mostly roads, via Shilton, across the Fosse Way at Cloudesley Bush and Watling Street near Willey, and then past the ginormous warehousing centre of Magna Park outside Lutterworth. I camped behind the village hall in Ashby Parva (524887) with the encouragement of the locals at the Holly Bush. This was a pleasant, dry day. The morning was virtually all on roads, and the afternoon virtually all on footpaths (part of the Coventry Way), skirting the city to its west. In the morning the Watershed crosses the Stratford-upon-Avon Canal and the Grand Union Canal. I saw a notice (see photo) underneath the bridge over the GUC - confirming that I was in the right place. 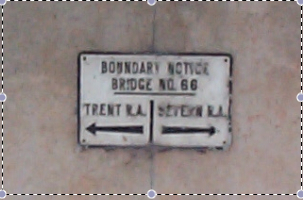 The Trent River Authority was responsible to the left, and the Severn to the right. I lunched at the Famous Tipperary Inn at Meer End, where the tune had been written in 1915. 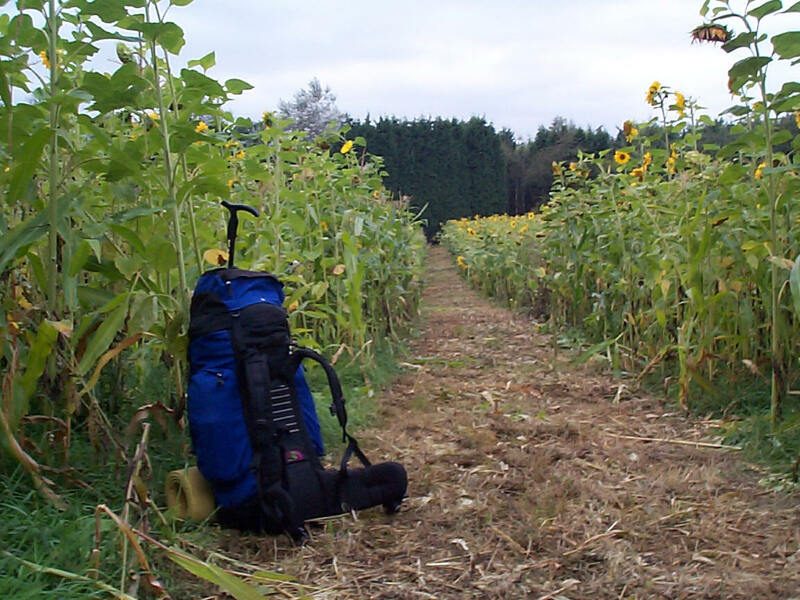 Then onto map 140, and a serious of good but flat footpaths across farmland. There was plenty of wildlife - squirrels, hares, rabbits and shrews - and an abundance of oak trees. By late afternoon I'd reached the Queen's Head near Meriden, which I learned about the village's claim to be the centre of England. 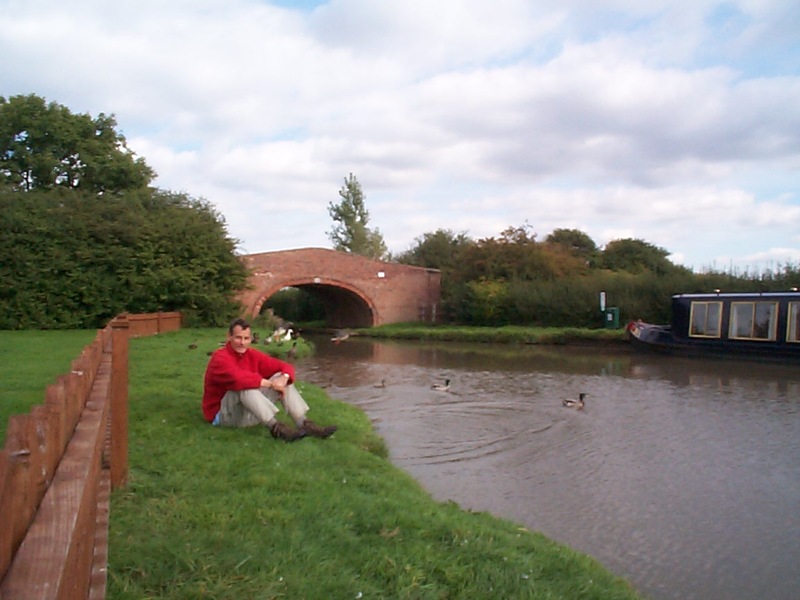 I had a bad and painful stumble as I got onto the footbridge over the M6, but was able to make my way to Fillongley, where I camped in the back garden (at 291874) of a couple who made me very welcome (and even gave me some money for my sponsored charity). After arriving by train from Cambridge, I walked up past the sadly deserted Longbridge car plant - closed down since I was here last year. I perused the Lickey Hills visitor centre for a few minutes before setting off on the Watershed at about noon - on the North Worcs Path apart from essential stream-avoiding detours, until lunch at the Peacock in Forhill. The afternoon was solid road-walking - Birch Acre, over the M42, Branson's Cross, Wood End, then over the M42 again, immediately followed by dropping down to a short stretch of bridleway alongside the motorway. Towards the end of the bridleway I found a parked car with its engine running and a tube from the exhaust into a window - a suicide attempt in progress. There'll be more about this in the book, but suffice it to say that the man thought better of it and drove off after he realised I was there. I told the police, and they later phoned me so say that there'd been no suicide attempts elsewhere in the area during the following couple of days. Obviously this episode was a real shock, but I was relieved that my intervention had made a difference. I then crossed the M42 for the 3rd time today, and got talking to a jogger - he slowed down rather than me speeding up! He'd been on the Great North Run the previous day, when 4 runners had died from heat exhaustion - another reminder of mortality. A footpath took me to Umbersdale Baptist Church (see photo) which looked redundant, but was about to get a makeover by the Historic Chapels Trust. The night was spent in the most luxurious camp setting of the Watershed, on an immaculate lawn between a putting green, a swimming pool and a tennis court! (The book will explain how). The location was 157715.